This title was first published in 2001. Based on a unique set of structured interviews with parliamentarians and additional interviews with party leaders and activists, this significant volume provides an illuminating account of the formation of the new democracies in Czechoslovakia and later, the Czech Republic and Slovakia. Examining efforts to construct stable democratic parliamentary regimes in the wake of communist breakdown, it provides a rigorous analysis of parliaments’ relations with the electorate and the executive, as well as their internal working. Richly detailed and clearly written, this original study is an invaluable addition to the collection of anyone interested in post-communist Europe or parliamentary studies. 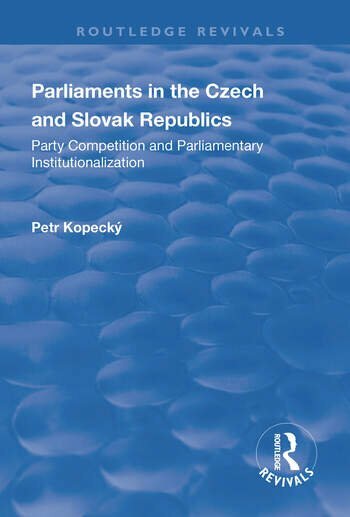 Contents: Introduction: transition, consolidation and parliamentary institutionalization; The institutional origins of the modern Czech and Slovak parliaments; Parliaments, parties and electorate: organizing representation; Executive-legislative relations: parliaments and governments; Executive-legislative relations: presidents; Inside the parliaments: parliamentary parties; Conclusion: growing apart? ; Appendix; Bibliography; Index.